This "weekend look" was what I wore out to brunch with Nick on Saturday. There's a small little family owned coffee shop with yummy homemade breakfast (best french toast ever!) that we discovered a couple of week's ago and it's become a favorite stopping place for us on Saturday mornings before we run errands and snap a few blog pics. The weather is slowly changing over to cold and it's been much more cool and crisp in the air lately. 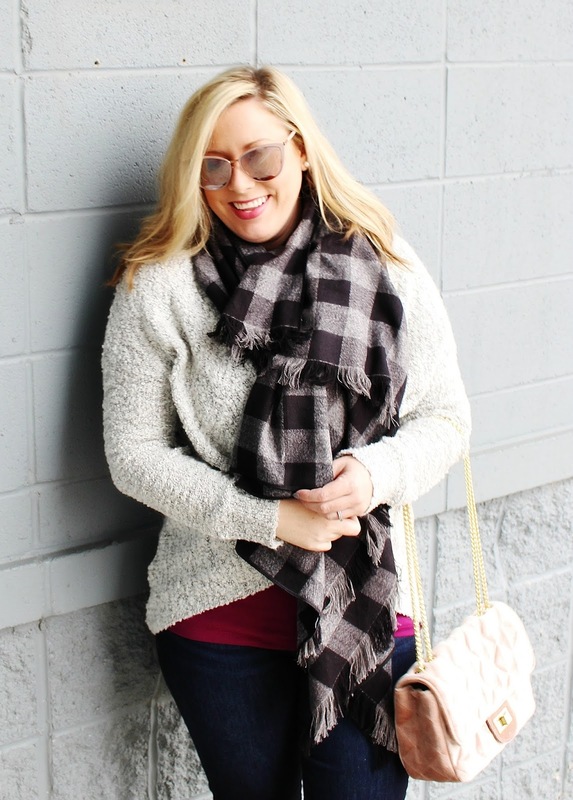 I thought it was finally the perfect time to style this black and gray buffalo checked blanket scarf for our brunch date. Scarfs are always one of my favorite fall and winter accessories. I also couldn't resist restyling this pullover wrap sweater again. It's been a 'go-to' sweater already this season because I just love the way the wrap detail looks and I also can't resist the cozy and warm fabric it's made out of. I found it in a darker gray color which I've linked below. I love your shoes! And that scarf is such a perfect checkered pattern. Cozy scarves are my fave for this time of year!! I also get a cough when it gets cold out so I make sure to protect my neck! I really like this look! 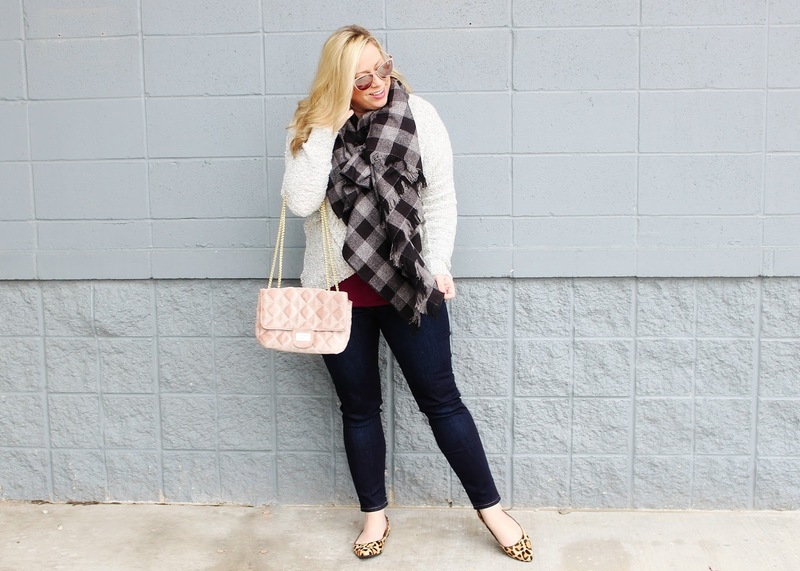 I always have such a hard time mixing different patterns and I love the combination of the scarf and shoes! Love this scarf! I’m on the prowl for a new green plaid scarf! We always underestimate how often we'll end up reaching for a great sweater cardigan in the winter. Love the texture of this one! We always underestimate how often we reach for a good cardigan sweater in the winter. I love the texture of this one! I love that scarf, it looks so warm! 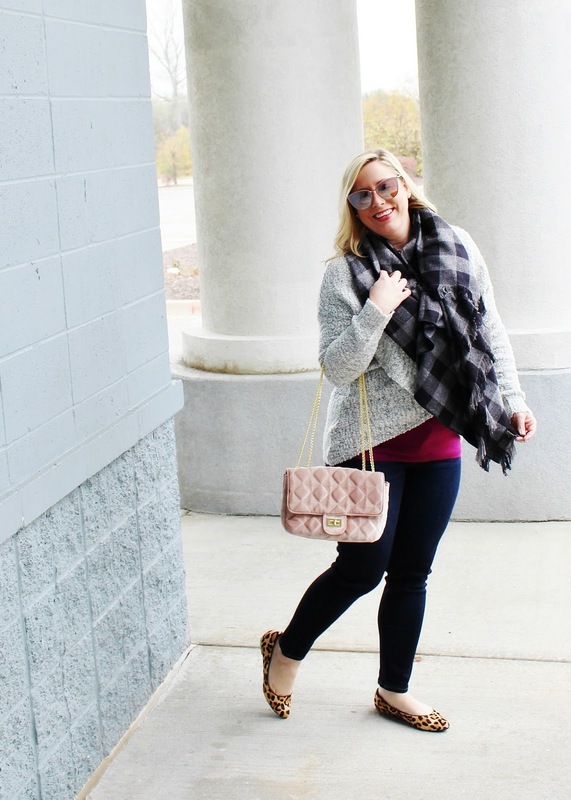 I love scarves that double as an accessory!